It’s easy to go through your day, week, and even life saying that certain things matter to you—that you stand for or against them and that they’re part of your values. But how often do you live up to these values? What guides you to stay on the path of living in integrity with your own personal life, business and career? A super effective way to make sure that you’re living true to your values is to ask yourself questions. I do this daily and have found it to be a powerful way to bring my key values to the forefront. This simple act helps me—and will help you—focus yourself so that you are able make decisions—and actions—that align with the goals you are striving towards, and the values you believe in. 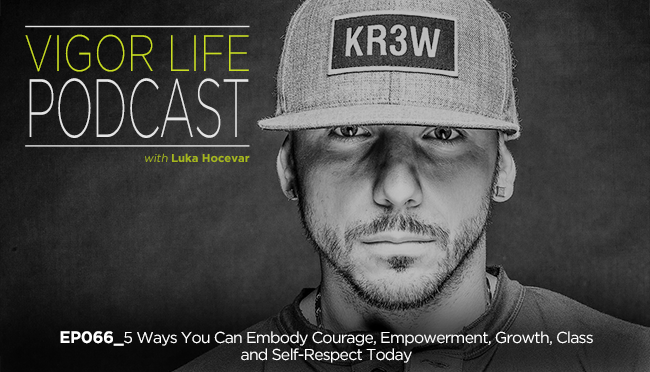 In this episode of the podcast I tackle the ways you can embody courage, empowerment, growth, class and self-respect in your life. And ultimately, help you practice what you preach and lead a more successful and fulfilling life. This entry was posted in Podcasts and tagged Entrepreneurship, Fear, Fitness, Fitness Business, Goals, Happiness, Life, Mindset, Personal Development, Podcast, Self Development, Self Help, Success, Transformation, VigorLife. Bookmark the permalink.